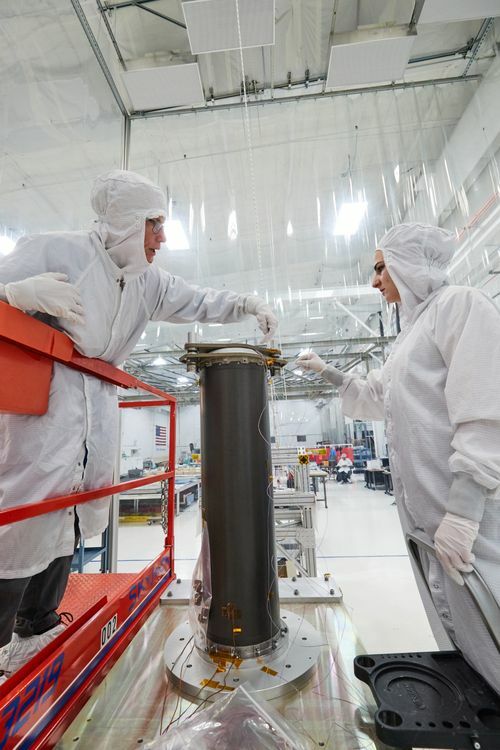 June 26, 2017 – Northrop Grumman Corporation reached another major milestone for NASA’s James Webb Space Telescope, with the delivery of the mid-boom assemblies. The graphite-epoxy assemblies were designed, built, and tested by Astro Aerospace, a Northrop Grumman business. NASA’s James Webb Space Telescope is made up of four major components — the telescope, the integrated science instrument module, the spacecraft and the sunshield. The two boom assemblies will help deploy the large sunshield once Webb is in orbit. The assemblies were delivered following successful environmental testing at Astro Aerospace to Northrop Grumman’s Space Park facility in Redondo Beach, California. Northrop Grumman is under contract to NASA’s Goddard Space Flight Center in Greenbelt, Maryland, for the design and development of the Webb telescope’s optics, sunshield, and spacecraft. The mid-boom assemblies attach to the sides of the spacecraft bus and extend in length to deploy the sunshield. Each one consists of six telescoping graphite-epoxy composite tubes, one nested inside the other, with Astro Aerospace’s tempered pre-curved stainless steel strip, or Storable Tubular Extendible Member (STEM™), inside that is wound on a motorized spool at the root end, some stainless steel cables, and a set of pulleys and springs on the tip end. The mid-booms work much like a deployable car antenna. As the STEM™ unwinds from its motorized spool, it curls onto itself to form a stiff tube that pushes the nested composite tubes out until the five movable tubes are fully extended and locked out. The tubes are constructed of graphite-epoxy composite material to be lightweight, stiff, and strong to ensure stability with extreme changes in temperature. As the mid-booms extend, they pull out Webb’s sunshield membranes with them, thereby unfolding them. Once the tubes are fully extended, the STEM™ is retracted which reels in a cable through pulleys at the tips of the boom which separate and properly tension each sunshield membrane. The mid-boom assemblies were designed and built by Astro Aerospace in Goleta, California. The James Webb Space Telescope is the world’s next-generation space observatory and scientific successor to the Hubble Space Telescope. The most powerful infrared space telescope ever built, the Webb telescope will observe the most distant objects in the universe, provide images of the first galaxies formed, and study unexplored planets around distant stars. The Webb telescope is a joint project of NASA, the European Space Agency (ESA), and the Canadian Space Agency (CSA).